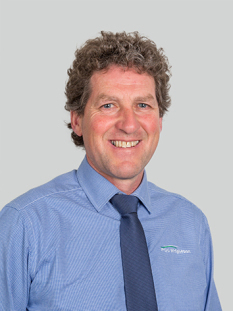 Andrew Patterson has sold rural real estate in Southland since 1993, prior to which he worked as a livestock agent for 12 years, always for PGG Wrightson. Within PGG Wrightson Real Estate's nationwide network, Andrew has been the highest achieving salesperson by revenue on six occasions and currently sits at number three in New Zealand. Highlights of his career include negotiation of three high-value rural property sales - the Van den Eynden property at Edendale that sold for $29.5 million, Glencairn Land Co at Dipton that sold for $33 million, and Ludlow Holdings at Opio that sold for $29 million. Notwithstanding this, Andrew has concluded hundreds of smaller, traditional-type rural property sales during this time. As the company's Real Estate Manager for Southland, he leads an office comprising a team of 12 salespeople that has won national titles for sales and revenue achievement on numerous occasions. Beyond his rural real estate career, Andrew is actively involved in farming in his own right. Along with his partner, Maria, and their three school-aged children, they farm a 100 hectare beef finishing property at Longbush. Extensive and detailed background knowledge in the farming industry, coupled with on-going day-to-day personal experience as a farmer. Local knowledge and networks built up over more than 35 years in Southland. Integrity, discretion and attention to detail is demonstrated by his will and presence to process multiple exceptionally high-value farm sales. Understanding the objectives of farmers around the sale and purchase of land whilst keeping all parties communicating. Your farm sale will be one of the largest transactions in your lifetime. My recommendation is that you are totally comfortable with your salesperson, be it myself or someone else. You must have confidence in their discretion, ability and professional network before engaging with them. Whether you are a willing buyer, a willing seller or simply require some independent advice to do with farmland, I can give you objectivity, direction and the confidence you need to proceed to your best advantage. Lester Wright is General Manager of Rimanui Farms Ltd, owner of a number of large sheep and cattle farms throughout New Zealand. In October 2014, acting on behalf of Rimanui, Andrew Patterson and Tony Paterson of PGG Wrightson Real Estate, Invercargill, sold Greenvale Station, a 2583 hectare 18,000 stock unit hill country property near the southern end of Lake Wakatipu. Please view the testimonial that has been supplied by Lester.